I’ve been wearing my Vibram FiveFingers KSO toe shoes now for three months and absolutely love them. That said, I have plenty to say both positive and negative. I’m not going to rehash what they are and their general advantages, these things have been covered many times since they came out years ago. Instead, I’m going to focus on a things I haven’t seen covered much or need reenforcement. I know this has been covered many times but I need to emphasize it. Try the shoes on before you purchase them. Measuring your feet will not let you know how well they fit you. I measured and thought I knew the correct size. Turns out I must have mutant feet because my small toes were crushed and I needed to go up one size. My second smallest toes are almost the same length so there is a ton of extra room in them. This isn’t a problem, it’s just a bit odd. I would have never know this had I purchased them online. The local EMS had them in stock and gives a Everything discount to students. I got to try them on and saved money. Win win! Many people only use their Vibram FiveFingers shoes at cheap jerseys the gym, for 金曜星 running, or other similar activities. I decided before I bought them that I wanted to replace my regular shoes with them. I decided to buy the KSOs because they seemed to be the best balance between lightweight, breathable, and suitable for daily use. On a regular dry day they work great but there are plenty of times when I have to slip on the old clogs. I bought mine in December, right in the middle of the Rochester winter. I found that the cold didn’t bother me. 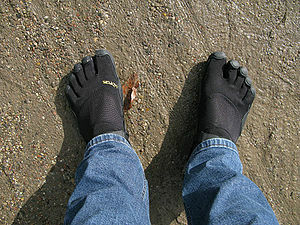 Combining Injinji wool toe socks with them was colder than wholesale nba jerseys “normal” shoes but still warm enough. On snowy, and especially slushy days, I wore boots instead since the snow and slush could easily get through the light mesh and soak my socks. The same applies to rainy days. Water can easily splash up and get into the shoes. I wanted to buy a pair of KSO’s since I found out about them in late spring but didn’t end up purchasing until December. I did buy a few pairs of Injinji toe socks in early summer and got used to wearing them. When I bought the shoes I tried them with Starter and without socks. While it seems like many people prefer to wear them barefoot I found I vastly prefer socks for two simple reasons: comfort and smell. I recommend wool socks due to their superior odor suppression, cushion, and sweat wicking. I’ve found that wearing socks greatly increase the comfort level of FiveFinger shoes. The cushion they add, comment albeit small, makes a difference when walking over rough ground such as gravel. It dulls the pointyness of what you’re walking on. I also find the toe seams very irritating. There is extra material inside the shoes where the toes are sown. This material rubs against some of my toes and jams into others, resulting in redness, irritation, and chafing. Wearing toe socks completely eliminates this problem. Some people gloss over cheap nba jerseys the smell these shoes can emanate. If you wear them without socks they will smell like rotting flesh, especially if you wear them – working out and sweat in them. Some have claimed that it’s not a wholesale nba jerseys problem since they’re easy to wash. I disagree. I don’t want to have to wash my shoes every few days, which is how often you have to clean them if you want to prevent scaring away all your friends. They can take a long time to dry too, up to 12 hours on humid days. By wearing socks I’ve eliminated the need to wash them regularly. They can go a month or longer without a trace of odor. Vibram has added a lot of new styles to their FiveFingers lineup. As of now there are 9 men’s, 12 women’s, and one children’s styles. Review each and determine which fits your needs the best. Keep in mind that each style fits a little differently and your local store may carry only the most popular styles. You may end up trying on a style you don’t want, ordering the ones you want online, and hoping you like them. Make sure you buy from a company that offers free returns. Once you wear FiveFingers shoes regularly you won’t want to wear traditional shoes again. You may develop strength in muscles you didn’t realize you had. People will come up to you all the time and ask about them. Whether you’re trail running or sitting at the office, you’ll be happy you’re wearing FiveFingers. Totally agreed about “Try it on before buying”. Mine ended up 2 sizes up accordingly to on-line size chart. Same issue as different length of pinky toes. Good tip of wearing socks, thank you. My right foot hurt on front sole and big toe ball joint after 1 week power walk on my 5fingers, I need to rest for a week. I’m a couple months in to my first pair. The tips of my toes are now rubbing as if the shoes are too small now. My friend has been wearing them for years and told me that my toes are lengthening out because they are no longer being smashed in my Nike’s. That’s precisely why I bought these and my toes now feel amazing! REI offers a one year warranty, mine already had some rubber come off so when I trade I’ll get a size up. Totally recommend them!